SAINT-ÉTIENNE DE LA TOUR, CLAUDE DE [the family name may well have been Turgis], fur-trader and prominent colonist in Acadia, father of Charles de Saint-Étienne de La Tour; b. c. 1570 in the province of Champagne, France; d. after 1636. Claude de La Tour saw service as a ship’s captain in the religious wars during which he suffered heavy financial loss. 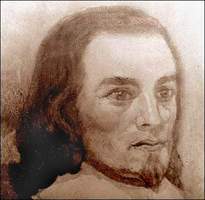 In 1609 he accepted an invitation from Jean de Biencourt de Poutrincourt to come to Acadia to assist him in forming a permanent colony at Port-Royal (now Annapolis Royal, N.S. ), that settlement having been abandoned two years before. He sailed from Dieppe with Poutrincourt on 25 Feb. 1610 and after a passage of several months the party arrived at Port-Royal. Here Claude assisted in superintending the construction of buildings and the tilling of the soil, and he learned the various phases of the fur trade. With the destruction of Port-Royal by Samuel Argall in 1613, he appears to have turned his attention to fur-trading activities in the Penobscot area and there in the course of time built Fort Pentagouet, a combined fortified trading post and fishing station. This post, termed the first permanent settlement in New England, proved to be a highly profitable outlet for the fur trade. About 1626, Claude de La Tour was driven from Fort Pentagouet by the Plymouth colony. He then returned to France to sell some of his lands in Champagne, and he also presented a request on behalf of his son Charles, acting governor of Acadia, for a commission and supplies. He was then assigned by the Compagnie de la Nouvelle-France to a supply ship being sent, apparently under the command of Father Philibert Noyrot, to Charles’s post at Cap de Sable in the spring of 1628. This vessel and others on their way to Quebec, under the charge of Claude Roquemont, were captured by an English squadron led by Sir David Kirke. Claude de La Tour was made prisoner and taken to England. He was presented at court and there met many relatives and friends. He was evidently an adaptable man and it would appear that he felt his prospects to be better in England. At that time the English controlled the whole of Acadia with the exception of Charles de La Tour’s post at Cap de Sable, and he may well have felt the country was lost forever to his homeland. What is more, the French government had shown an almost complete lack of interest in Acadia for many years, and his son’s position in that province was both irregular and uncertain. The English considered Claude to be a great prize, for he apparently exaggerated his importance in Acadia, and his extensive knowledge of the country could prove of value. Claude in his turn was both clever and ambitious, and apparently never one to fret about seemingly lost causes, so that he was quickly won over by the English. He became friendly with one of the ladies-in-waiting to Queen Henrietta Maria and he married her. One historian recounts that this lady was a relative of Sir William Alexander the elder, who had been granted Acadia by King James. Whether this fact had any influence on Claude’s choice of a wife is not known, but it did prove very helpful. Alexander had already evolved an ambitious scheme for colonizing Acadia whereby large tracts of land and the title of “Baronet of Nova Scotia” would be offered to men willing to participate in the project. Claude de La Tour appears to have impressed Alexander with his knowledge of Acadia, and he evidently expressed a willingness to join in the colonization project. 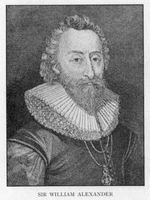 Details concerning his life during this period are lacking, but it would appear that he volunteered to accompany Sir William Alexander the younger as his assistant on an expedition that left for Acadia in the spring of 1629. He is believed to have spent most of that summer familiarizing the Scots with the country and gathering a cargo of furs in the Bay of Fundy area. On 6 October he apparently signed the rough draft of an accord with the younger Alexander at Charles Fort. In any case, he returned to England and on 30 November was made a baronet of Nova Scotia in recognition of his valuable assistance in exploring the country. It would seem that he then even promised to put the Alexander interests in possession of the whole of Acadia by persuading his son to surrender his fort at Cap de Sable and to accept English allegiance. On 12 May 1630, and unknown to Charles de La Tour, he accepted a baronetcy for his son. The titles brought with them a huge grant of land in the southern part of Nova Scotia. 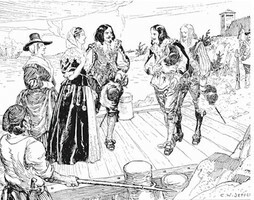 Claude de La Tour and his wife sailed for Acadia with a group of colonists and two English men-of-war in May 1630. When the vessels dropped anchor off Cap de Sable, Claude hastened to inform his son of all that had happened, and of the titles and honours awaiting him from the English king. Charles refused to make good his father’s promises and announced his firm intention of maintaining his French allegiance. Claude, having vowed to win over his son, tried entreaties, then threats, but Charles resisted all such efforts. At last the father declared he would be obliged to treat his son as an enemy. He rounded up a mixed force of soldiers and sailors from the two warships and attacked the fort at Cap de Sable. The ensuing battle between father and son lasted two days and a night and has no parallel in the history of the New World. This strange fight ended with the withdrawal of the English force in the face of the stout resistance put up by Charles. Having cast his lot, Claude could do no more than accompany the English to Port-Royal. Then, with an appealing nobility, he informed his wife that since his prospects now seemed so bleak, she was free to return to England. This she refused to do, choosing to remain and share her husband’s lot. It is here that we might expect Claude, stripped of both his reputation and his resources, to fade from the pages of history, but such was not the case. He wrote his son asking to be allowed to return to Cap de Sable and to French allegiance. On the advice of representatives of the Compagnie de la Nouvelle-France who had arrived with supplies and a governor’s commission for him, Charles finally agreed to the request. Now wise to the ways of Claude, however, Charles insisted he live with his wife in a house outside the fort and not enter the post itself. 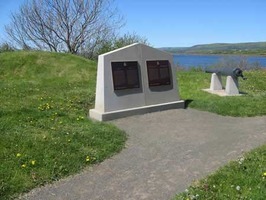 When Claude arrived at Cap de Sable he brought news that the garrison at Port-Royal had been strengthened and that a force would be sent to take the post at Cap de Sable, bringing the whole of Acadia under English control. Such an attack did not materialize and may well have been simply a product of Claude’s fertile mind. That he was an able man and valued as a fur-trader is borne out by the fact that when the Compagnie de la Nouvelle-France decided the next year to build a new post at the Saint John, the richest area for furs in all Acadia, it was resolved that Claude would be given the command of the new post. 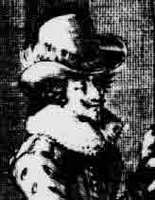 However, he remained at Cap de Sable and Jean-Daniel Chaline received the appointment instead. After Fort Pentagouet was recaptured from the English, it and a grant of land were given Claude de La Tour by the French Crown “in recognition of the recent service he has rendered the king.” The exact nature of that service is not known. It is unlikely, however, that Claude moved to Fort Pentagouet, for he seems to have remained in quiet retirement at Cap de Sable after 1631. 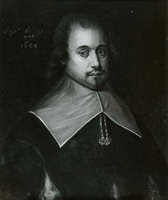 It was there that Nicolas Denys, another of the prominent figures in the Acadia of those days, found him living in 1635. He reports him to have been the picture of domestic bliss, a genial host who waxed enthusiastic about his extensive garden. He died sometime after 1636, a turn-coat, an opportunist, a rogue perhaps, but one who lends colour to the early history of Acadia. According to the researches of M. Robert Le Blant (“Du nouveau sur les La Tour,” SGCF Mémoires, XI (1960), 21–23), Claude de La Tour usually signed his name “de Saint-Étienne” but two notarial acts call him “Turgis, dit Saint-Étienne, écuyer, sieur de La Tour” and “Claude Turgis, dit Saint-Étienne et de La Tour.” It would seem therefore that the family name of the La Tours was “Turgis” and that the family was of the lesser nobility. On the documentary sources see PAC Report, 1883; 1894; 1912, 18, 23–24. Champlain, Works (Biggar), V, VI, Coll. de manuscrits relatifs à la Nouv.-France, I, 439; II, 351–80. Denys, Description and natural history (Ganong). Royal letters, charters, and tracts (Laing). Couillard Després, Saint-Étienne de La Tour. Huguet, Poutrincourt. Insh, Scottish colonial schemes. McGrail, Alexander. G. A. Wheeler, “Fort Pentagoet and the French occupation of Castine,” Maine Hist. Soc. Coll. and Proc., 2d ser., IV (1893), 113–23, See also bibliography for Charles de Saint-Étienne de La Tour. George MacBeath, “SAINT-ÉTIENNE DE LA TOUR, CLAUDE DE,” in Dictionary of Canadian Biography, vol. 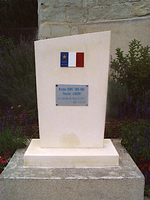 1, University of Toronto/Université Laval, 2003–, accessed April 21, 2019, http://www.biographi.ca/en/bio/saint_etienne_de_la_tour_claude_de_1E.html.